It's not an overstatement when we say that Lastovo, the second farthest island in Croatia (a 5 hour drive with a ferry from Split) is an island of unspoilt beauty! The state also recognised that and made Lastovo, together with its archipelago in 2006 a Nature park. However, until the beginning of the nineties, Lastovo was for a long time (almost 50 years) closed for tourists, like Vis, because the Jugoslav army had its base there. After Croatia gained its independence, Lastovo began to slowly open to the outside world. Although it still isn't crowded like neighbouring islands and coastal towns, Lastovo is starting to be more popular among tourists looking for a getaway from everday stress. Even the British newspaper Guardian made an article about Lastovo in May 2017 praising its peacefulness, beautiful nature and exquisite sea food. So, book your accommodation on Lastovo and explore this heavenly island where you'll rejuvenate yourself. How to get to Lastovo? Although Lastovo is one of the farthest islands in Croatia, there are several ways to get there, especially during high season. You can get there with a ferry line or fast boat from Split and Korčula (Vela Luka). The ferry trip lasts around 5 hours while travelling by speed boat lasts 3 hours. During high season (July and August) you can get to Lastovo from Dubrovnik with a speed boat in 4 hours. On some ferry lines it's possible to bring a bike along, and you must pay a fee. Although small, geographically isolated and unburdened by mass tourism, Lastovo is rich with interesting content, activities and places to visit, especially for those who love to explore nature. You should visit the most populated place on the island – Lastovo (it has around 500 inhabitants). It's hidden in the hills (in order to prevent pirate attacks). This picturesque town has several renaissance and baroque chruches like the church of saint Kuzma and Damjan (Cosmo and Damien). The whole island has an astonishing number of 38 churches, 28 of which are registered as cultural heritage sites. The little town of Lastovo is also special for its fumari, decorated and diverse chimneys found on every house built in the 15th and 16th century. 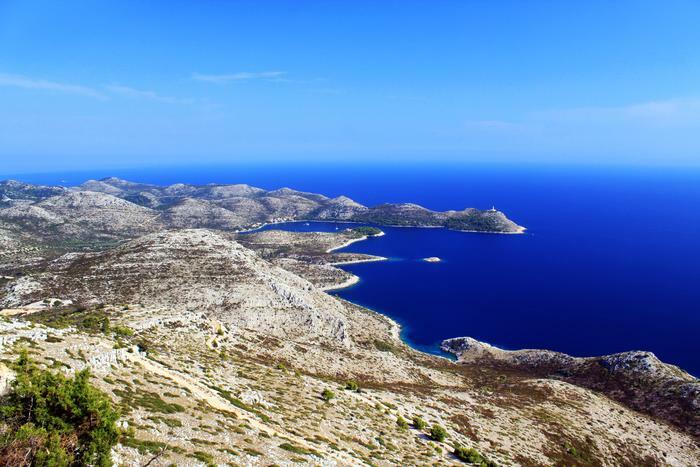 Make sure you hike to the tallest hill on the island – hill Hum that stands above Lastovo. Don't forget to take a snapshot of the beautiful view you'll find strewn below you. You'll see the islands and islets of the Lastovo archipelago and island Korčula. After enjoying the view, descend to the sea and visit Zaklopatica cove where you'll find the diving centre Ancora where diving enthusiasts and also those who are yet to become that, can explore with a guide the rich underwater world of Lastovo. The most popular spots for diving are islet Bijelac – one of the most popular and beautiful diving spots in Europe and Tajan which has an indented seafloor with lots of hidden caves and holes and also rich and colorful animal and plant world. After your diving adventure, head to the nearby family fish restaurant and try out some of the best seafood you'll ever have. Because of great walking distances between settlements, we recommend you to sightsee Lastovo with a car or a bike – the island is interconnected with bike trails of different difficulty levels. If you plan to visit Lastovo during the summer, that's the ideal time of the year for you to explore its hidden beaches and coves shaded with lush mediterranean forests. The exceptionaly clean sea invites you for a dive! Also, you can rent out a boat from the locals and explore the little islands of the Lastovo archipelago nad continue your adventure there. There's just one sandy beach on Lastovo – named Saplun (which is an Italian word for sand!). It's on the islet Mladine. Rent out a boat and escape to this little beach and enjoy by yourself its beauties and surrounded by a big shade. Make your evenings and nights on Lastovo special. Bring along a blankie, sit somewhere high on a clear night and look at the nightsky. You can see on Lastovo much more stars than ususal because a lack of neon lights and other artificial lights.